Researchers may have discovered a link between the neurohormone oxytocin and autism. Studies at the NYU Langone Medical Center show that oxytocin help the brain process information by filtering out background signals and increases the strength of desired signals. From past data, they have noted that people with Autism Spectrum Disorder (ASD) have low levels of oxytocin and that mutations in the oxytocin receptor gene predispose people to autism. Oxytocin is a neurohypophysial hormone present in mammals and acts primarily as a neuromodulator in the brain. Neuromodulators affect multiple neurons at once and are diffused through large areas of the nervous system. Oxytocin is usually associated with parenting and social bonding behavior through psychological behaviors such as trust, pair bonding, and empathy. In a loud, crowded restaurant, having the ability to focus on the people and conversation at your own table is critical. Nerve cells in the brain face similar challenges in separating wanted messages from background chatter. A key element in this process appears to be oxytocin, typically known as the “love hormone” for its role in promoting social and parental bonding. In a study appearing online August 4 in Nature, NYU Langone Medical Center researchers decipher how oxytocin, acting as a neurohormone in the brain, not only reduces background noise, but more importantly, increases the strength of desired signals. These findings may be relevant to autism, which affects one in 88 children in the United States. Children and adults with autism-spectrum disorder (ASD) struggle with recognizing the emotions of others and are easily distracted by extraneous features of their environment. Previous studies have shown that children with autism have lower levels of oxytocin, and mutations in the oxytocin receptor gene predispose people to autism. Recent brain recordings from people with ASD show impairments in the transmission of even simple sensory signals. The current study built upon 30-year old results from researchers in Geneva, who showed that oxytocin acted in the hippocampus, a region of the brain involved in memory and cognition. 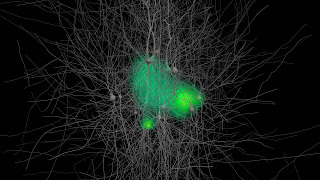 The hormone stimulated nerve cells – called inhibitory interneurons – to release a chemical called GABA. This substance dampens the activity of the adjoining excitatory nerve cells, known as pyramidal cells. To resolve this paradox, Dr. Tsien and his Stanford graduate student Scott Owen collaborated with Gord Fishell, PhD, the Julius Raynes Professor of Neuroscience and Physiology at NYU Langone Medical Center, and NYU graduate student Sebnem Tuncdemir. They identified the particular type of inhibitory interneurons responsible for the effects of oxytocin: “fast-spiking” inhibitory interneurons. The mystery of how oxytocin drives these fast-spiking inhibitory cells to fire, yet also increases signaling to pyramidal neurons, was solved through studies with rodent models. The researchers found that continually activating the fast-spiking inhibitory neurons – good for lowering background noise – also causes their GABA-releasing synapses to fatigue. Accordingly, when a stimulus arrives, the tired synapses release less GABA and excitation of the pyramidal neuron is not dampened as much, so that excitation drives the pyramidal neuron’s firing more reliably.